Peresoft is pleased to announce the release of Cashbook, RecXpress, RecXpress for Bank Services and EFTXpress 2018. Speed improvement on Cashbook bank reconciliation date range selection. Distribution Set Fixed Percentage Allocation - Specify the percentage of the total amount to allocate to each distribution set line. 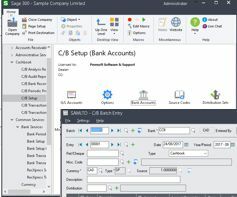 Inactive Bank Option - Option to set the bank as inactive to not print on the bank summary report and prevent batch entries or reconciliation. Default Tax Method by Bank - Option to set Default Tax Method by bank to Calculate, Enter or Tax Line. Inactive Bank in Bank Reconciliation - Bank reconciliation for inactive bank opens in read-only mode. Show All Marked Entries - Option to show all marked entries in bank reconciliation. Adjust All Marked Entries - Option to adjust marked entries range in bank reconciliation. Reconcile Adjustment Entries During Posting - Option in posting to reconcile adjustment entries. Post button in Batch Entry to post the batch from within the batch. Entered By field in Batch Entry to indicate the User that entered the batch. for a quick check of the Cashbook balances. 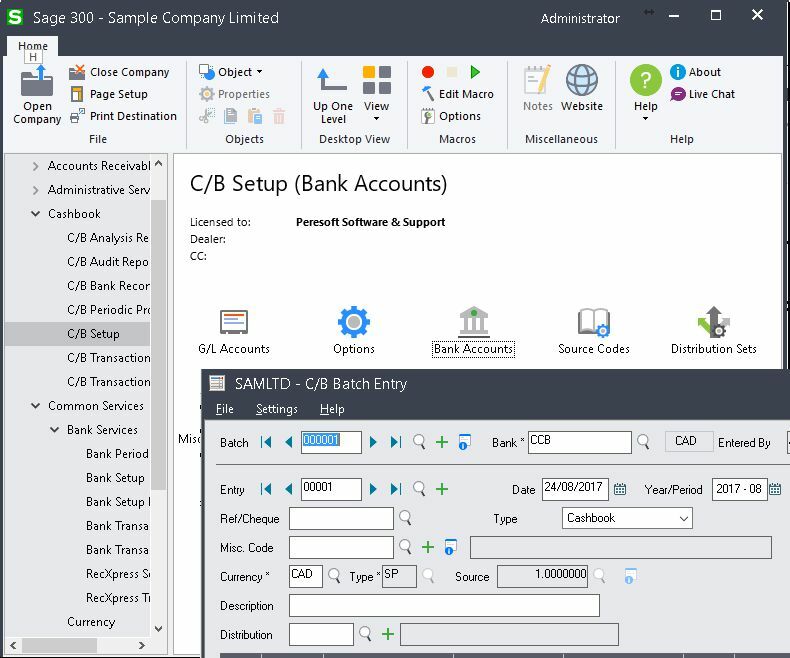 Option for Multiple reconciliation  Option to reconcile a single or multiple bank statement entries to a single or multiple Cashbook entries. RecXpress Statement History - History of posted bank statement reconciliations. RecXpress History Cashbook Transaction Detail Drill Down - Drill down to detail in Cashbook transaction or history file. Match With Error Option - Option to select whether entries should be matched with error or not during bank statement import. Reconciliation Match Options - Option to match entries by Reference, Reference|Description, Description, Description|Reference during bank statement import. Generate Unapplied Cash AR Receipt entries. Finder on Compare Description field in Template Rules  To easily find any rule in the Rules Template. Auto Allocate Accounts Payable and Accounts Receivable entries by Document Number, Document Date or Due Date when generating batches. RecXpress Options - Option to Post Cashbook RecXpress batches automatically. RecXpress Options - Option to set RecXpress Auto Allocate Defaults. Entry Date - Enter the date at which the Cashbook entry is generated in the batch. Filter on the Cashbook transactions displayed in the RecXpress reconciliation. Drill down to the layout of the bank format in the Bank Formats list. Setup payment information for multiple vendor bank accounts per Cashbook Bank Code. Additional fields available to select for My Statement Description Setup and Beneficiary Statement Description Setup. Drill down to view required fields for a particular bank format. EFT Process Date moved from EFT Bank Setup to Batch Control for easy editing. For a full list of features in Peresoft's 2017 products you can view this powerpoint presentation.